While most people enjoy having a break from school and work during summer, some students travel a long way for exactly the opposite. 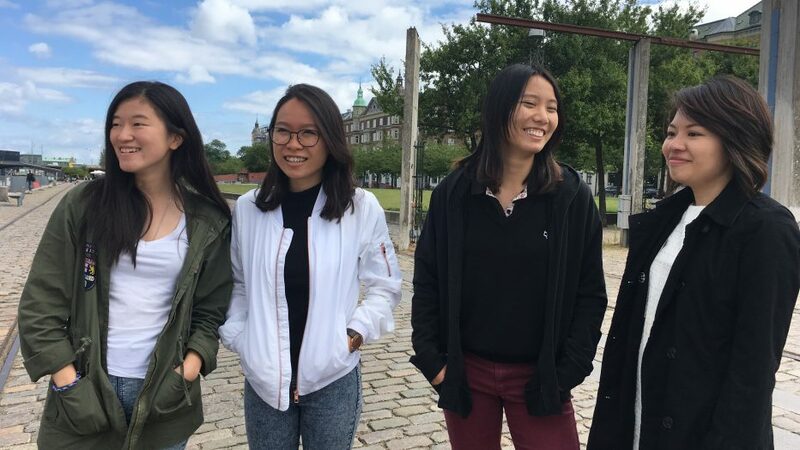 Clare Lim Min, Vanessa Choo Kwan May, Yu Lin Ong and Regina Lim Fang Qi are all students at Singapore Management University (SMU) who have come to Copenhagen for two months in order to take part in a summer school that emphasises entrepreneurship at CBS through internships at Vejrhøj and Sitpack, both start up-companies founded by alumnus from CBS. Sitpack was founded by Jonas Lind-Bendixen (CBS) and Theo Fischer Ginman (DTU) back in 2014. It’s a hardware company producing a compact and foldable seat which fits in 17 centimeters can. The company just started selling the chair in Japan, China, and Korea last year and has recently started selling it to Danish online retailers. So far, Jonas Lind-Bendixen estimates that the company has sold about 40,000 units. Jonas Lind-Bendixen has a degree in Asian studies from CBS and his partner Theo Fischer Ginman holds a Master’s in design and innovation from DTU and has competencies in developing the actual product through the use of 3D-printers. “I thought; why not come to Denmark? 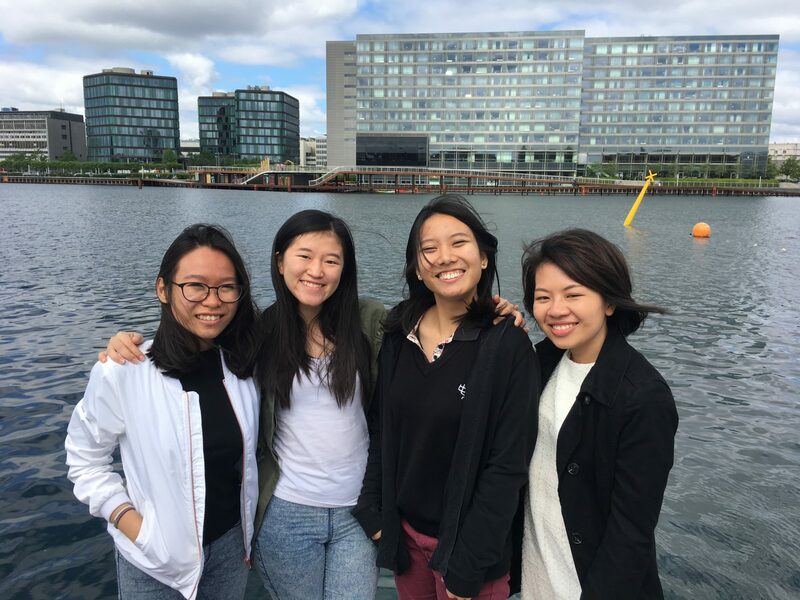 It’s the second happiest nation in the world, and it would be an amazing opportunity to go to Europe and get some experience with start-ups,” says Vanessa Choo Kwan May, who studies social science and strategy management at SMU and is an intern at the watch company Vejrhøj. The founders of Sitpack, Jonas Lind-Bendixen, and Vejrhøj, Janus Aarup have both been part of the Go Grow program at Copenhagen School of Entrepreneurship (CSE), before they got established as companies. And to them, it makes perfect sense to have interns from Singapore. “We got contacted by CSE, which we have previously been part of, asking if we would be interested in interns from Singapore. And it makes good sense having them here, as they help us out with number crunching, budget forecasts, and ideas on how to launch the next collection in Asia and elsewhere,” says Jonas Lind-Bendixen, CEO at Sitpack. Janus Aarup got the idea for designing and crafting watches out of wood and steel when he wrote his Master’s thesis at CBS. Shortly after, he founded the company, Vejrhøj, in 2013. The latest collection is made in collaboration with the renowned designer Bo Bonfils. Janus Aarup has a bachelor degree in International Business and a Master in Marketing and Management from CBS. In Asia, Janus Aarup from Vejrhøj is mainly operating in Singapore, Taiwan and Japan, which Vanessa Choo Kwan May and Clare Lim Min are assisting with. “They have made an in-depth analysis of the Japanese and Southeast Asian watch market, which would have been very difficult for us to do on our own. It is valuable research, which gives us a better basis for making the right decisions. So, it is of great help,” says Janus Aarup, CEO at Vejrhøj. When the students were asked, why they wanted to be interns at start-ups, as they can be a little more unstructured and less settled in the way of working, they all responded that it was exactly the flexibility and unsettledness that seemed attractive. “I have primarily been working for governments and insurance companies, which is way different from working for a start-up. The big companies are more bureaucratic, it’s more structured and they are less flexible. In startups, it’s super flexible, and you have to be able to multitask as there are many things to do,” says Vanessa Choo Kwan May. Clare Lim Min, who studies social science and marketing, says that she feels her work is actually being of use to Janus Aarup. Something that she wouldn’t experience too often back in Singapore. “A start-up is so open, which is nice because I feel like I can contribute with my marketing skills, and that they are being appreciated,” she says. 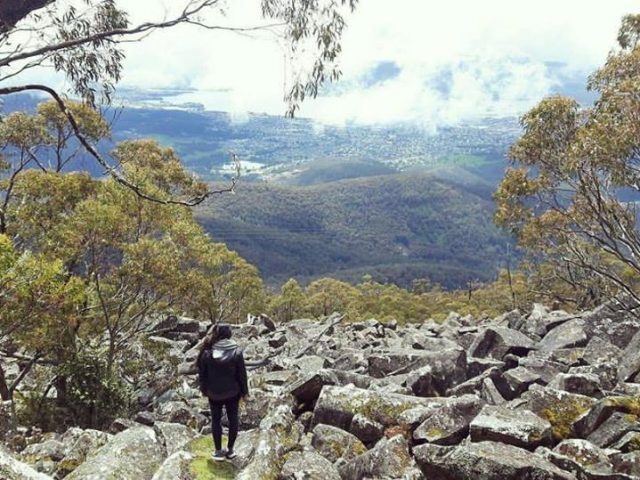 To Regina Lim Fang Qi and Yu Lin Ong, who both are interns at Sitpack, it is of great value seeing a start-up company from the inside, as they are in the process of developing start-ups themselves. “I get to know exactly how a start-up works. Here at Sitpack they have been through different stages of development, and I get to follow their ongoing process to make the company a success. The things I learn here, I can bring back to Singapore and apply to my own startup,” says Regina Lim Fang Qi. 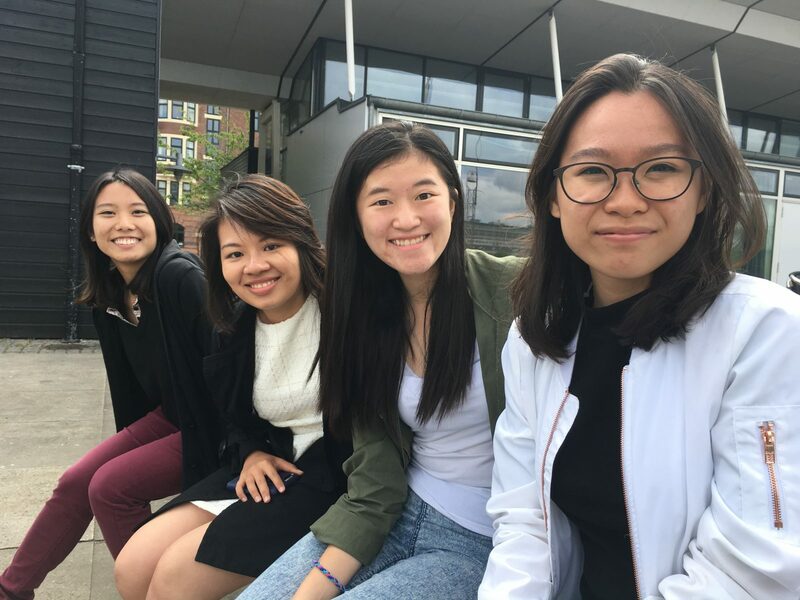 Combining the experiences from SitPack with what is taught at the summer school about business proposals and business plans, Yu Lin Ong and Regina Lim Fang Qi have a lot of work to do, when they come back to their own start-ups. “Business proposals wasn’t really something I spent a lot of time doing, and the requirements to make one at SMU are very loose. Now, I’ve been taught the importance of them and how to write one, and that it is more about the process making one that really matters, so this is definitely something I will apply to my own startup,” says Yu Lin Ong. Both at Sitpack and Vejrhøj the four students are given different tasks, and this is something Jonas Lind-Bendixen and Janus Aarup prioritize. “They are sitting along in the engine room doing market analyses in different countries, making price strategies for our new collection and we get their feedback on the product. In the end, we try to figure out what would be a bestseller in the Asian market,” says Janus Aarup. You eat cold food for lunch. What’s up with that? “For example, it’s important that they get to see that it’s not that easy moving your entire stock from one place to another, and they also see that we have to buy basic things such as tape and boxes for storage. There is a value chain, and it is a process they get to be involved in. 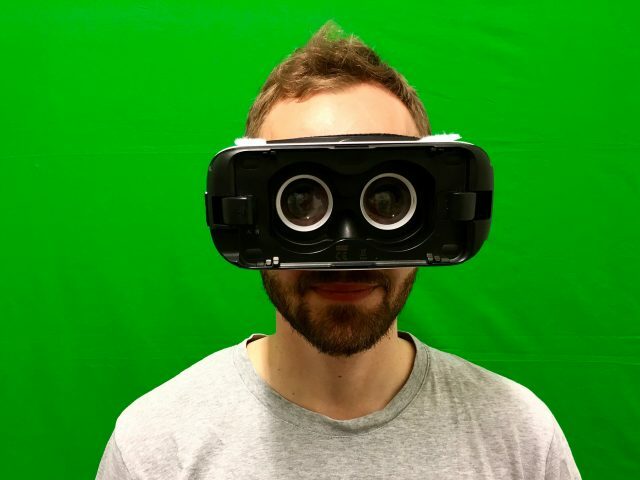 Things happen outside of Excel also,” says Jonas Lind-Bendixen. While the Singaporean students are here they not only get to learn about business development and proposals. They also get to see the Danish culture and its – to foreigners – weird quirks. One thing, Yu Lin Ong and Regina Lim Fang Qi agreed on as an oddity was the food. It’s not so much the food itself, but rather the temperature of it. “I have sort of gotten used to eating the cold food, but I would always go for a kebab for lunch. It’s so good,” says Yu Lin Ong. Another thing that strikes the Singaporean students is the work-life balance, and how relaxed Danes are in general. “It’s my first time in Europe, and I really like the slow pace of life here. In Singapore, it’s way more hectic, and you would work all the time. But you have got time to relax, and your working hours are very flexible. I would like to take things a little slower back in Singapore and enjoy the little things,” says Vanessa Choo Kwan May. Melbourne: The coffee capital of the world?